Immunogen: Rat skeletal muscle Hsp20. 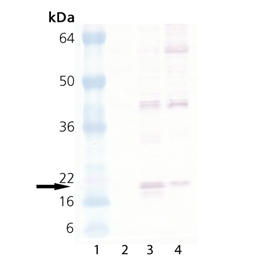 Application Notes: Detects a band of ~20kDa by Western blot. Formulation: Liquid. In 0.1M phosphate buffer, pH 7.0, containing 3% BSA and 0.09% sodium azide. Scientific Background: Hsp20 is a member of the family of small heat shock proteins (sHsps), with homology to Hsp25, Hsp27, and alphaB-crystallin. Highest expression of Hsp20 is found in skeletal, smooth, and cardiac muscle. Under heat shock, Hsp20 translocates from the cytosol to the nucleus, although the amount of Hsp20 in the cell does not increase like other Hsps. Hsp20 oligomerization and interaction with polymeric actin filaments is regulated via phosphorylation by PKA and PKG.